Summertime is a great family fun, especially when you’ve got that clean pool to beat the warm weather. You’ll agree with me that a clean swimming pool is one thing that makes a wonderful backyard. However, cleaning your pool can give you a headache in case you don’t have the right tool for the job. The trick is to search for the powerful and quality pool vacuum heads that has the capacity to clean up all the mess from your pool. The good thing about a vacuum head is that it provides an all-around cleaning including the floor, walls, and surface of the water. So what are the top picks when it comes to pool vacuum heads? This article looks at some of the best pool vacuum heads that provide powerful and easier cleaning experience. Read on and decide which one suits your pool best. 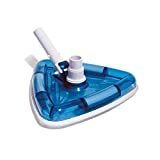 This is a remarkable pool vacuum head ideal for those looking for quick and flexible pool cleaning experience. It’s designed to tackle both domestic and professional pool cleaning tasks. The head is weighted, a feature that lets it hug the pool floor and provide more stability for greater control. This vacuum head is specially designed for concrete pool systems. It has a cleaning path of 14 inches, which is the widest in our list. That results in more coverage with each pass. This flexible pool vacuum head fits standard hose sizes measuring 1.25 and 1.5 inches. This is a brush pool vacuum head designed to sweep away all the filth and dirt from the pool floor. The head sports a unique, half-moon design that gives you an easier time cleaning around corners. It’s weighted to stay submerged yet manages to remain lightweight to minimize hand strain. The head weighs at just 1.5 pounds and is compatible with hose sizes of 1.25 and 1.5 inches. You get the convenience of a quick-snap adapter that accepts up to 99% of vacuum poles. The brush is replaceable so you don’t have to repurchase a complete head. 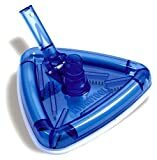 This vacuum head has a cleaning path of 11 inches and is designed for use in all pools. Have a large outdoor pool that needs something extra powerful? This efficient vacuum head can make the job easier and more stress-free. The head sports gentle, non-marring edges; a unique feature that makes it an ideal cleaner for fiberglass and vinyl liner pools. It comes in a triangular shape that provides a thorough cleaning by fitting through corners with ease. The brushes are angled to help pick up dirt and debris. The head is made of durable ABS plastic and is weighted to stay submerged. It has a cleaning path of 11 inches and fits hose sizes of 1.5 and 1.25 inches. Want some more accuracy when vacuuming around your pool? This see-through head will definitely suffice. The see-through design combines with a triangular shape to provide easy maneuvering across every inch of the pool. It’s weighted to hug the pool floor and comes with bumpers safe for use on vinyl pool liners. It doesn’t scratch or scrape and sports gentle nylon bristles that are angled to funnel dirt. The head is made of ABS plastic for long lasting durability and resistance to chemicals. It has 11-inch cleaning path with a spring-load mechanism for easy attachment of vacuum poles. This vacuum head is compatible with standard hose sizes of 1.5 and 1.25 inches. This vacuum head grades high among the brand’s classic collection. The head provides a perfect blend of usability and stability in subtle vinyl pool liners. The cleaner captivates your eyes with its clear transparent material fabricated from tough ABS plastic. It has a powerful vacuuming system and comes weighted to keep in on the pool floor. The head comes with replaceable quality brushes to provide a more detailed cleaning. It cleans 11 inches wide with each pass. The triangular shape makes it easier to access corners.